The easy way to enjoy Phillip Islands’ nature, wildlife, fun, entertainment and chocolate. 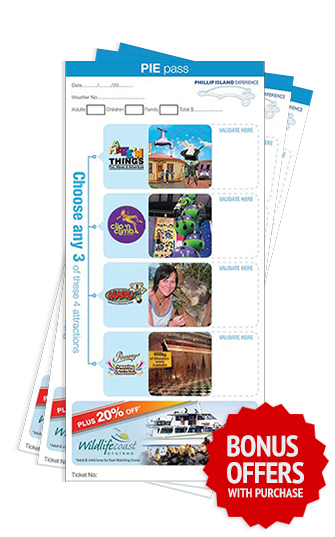 Just purchase your Phillip Island Experience pass and present the ticket at the 3 attractions you most wish to see. With 12 months to use your pass and special bonus offers for all our attractions. If you have purchased your Phillip Island Experience pass online, just print out the Rezdy ticket (which you will receive via email) and present it at the first PIE attraction you visit. Please note: You cannot collect a pass from the penguin parade. Phillip Island Experience “PIE” is a fantastic way to visit Phillip Islands’ finest Attractions and Tours with exclusive discounts and bonus offers. We have Four different passes and six different attractions which cover the best Phillip Island has to offer.